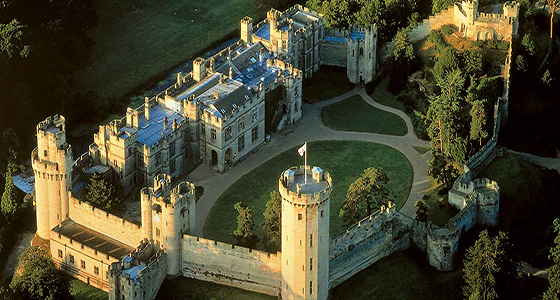 Warwick Castle is a medieval castle remodelled on an earlier castle built by William the Conqueror in 1068. The original wooden castle was rebuilt in the 12th century. During the Hundred Years War, the facde was refortified and is a most recognisable example of 14th century architecture. It was used as a stronghold until the early 17th century, when it was granted to Sir Fulke Greville by James I in 1604. Sir Greville converted it to a country house and it was owned by the Greville family, who became the Earls of WarwicK in 1959. Since 1978 it has been leased to a leisure company. Recording for EVP at Warwck Castle was technically the most difficult of any field location to date. It is nearly impossible to be certain that there are no visitors or staff within earshot due to public access of the buildings. Nevertheless, patience and determination were repaid with very good EVP. We had many more likely EVP clips but these were ruled out due to extraneous sounds. The clips selected all demonstrate the unusual character of EVP speech patterns, making them more easily defined as not being our own, or another person that was unknowingly present. EVP 1: Rachel and Tracey are standing in a grand hall that holds weapons and suits of armour, the EVP is very pertinent. They are the only visitors present in the location, yet the speaker sounds male. EVP 2: The word mock is not frequently used, yet it has been captured in EVP a number of times, always during field recordings and not during a regular seance. The voice of the well spoken gentleman is in modern English and similar to a voice captured at the Hell Fire Caves. EVP 2: was that mocking you? EVP 3: Tracey and Rachel are alone in an area with waxwork mannequins and Tracey is admiring the handicraft that would have been done by hand in the medieval period. The speaker of the EVP is clearly a child and has a heart warming tone. EVP 4: It is hard to appreciate that at the time of recording there were no other people present, neither is there a soundtrack playing in the background. The clip has more than one voice but we are only able to discern the speech of the male voice. EVP 4: Will you missed me? EVP 5: We recorded this clip in a room displaying the head of a deer. To have hunted without permission of a local Lord or land owner in the medieval period might have resulted in death, if caught. Is this the voice of a local poacher who wanted us to know his secret?